LT Salon Car is premium e-commerce WordPress theme well-suited for salon car websites. 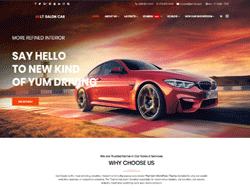 The theme presents luxury car images displaying the vehicles online that will attract many new customers. Moreover, it helps customers easily buy your products for delivery through online ordering systems and payment methods. You can use this theme to create online e-commerce solution really fast. LT Salon Car is 100% responsive that automatically adapts to any possible screen resolution of all mobile devices, displaying all the content in the best way. It comes with unlimited color and a color picker in the admin panel. Moreover, we offer support services like Bootstrap CSS & Hybrid framework, strong shortcode and drag-drop layout content… ready to help clients develop their websites.